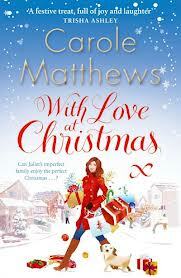 I loved Wrapped up in You by Carole Matthews last Christmas so I had extremely high hopes for With Love at Christmas this year ( No pressure Carole)! We are reintroduced to the characters we know and love from a previous book of Carole Matthews, That Loving Feeling which only made this book have even more of a warm cosy feel to it because of the familiarity to the characters. What I love about this group of characters and their story lines are that they are so down to earth that it often feels as though you are reading about the story of the people next door because it all feels so realistic. I love all of the characters but I have to say on more than one occasion I wanted to throttle them mainly Chloe who quite clearly is used to having everything handed to her on a plate and finds it all too easy to expect her mum to babysit at a drop of a hat because her little boy is obviously a pain when it comes to her social life but then I equally want to throttle Juliet just as much for giving in to her daughter so easy which does Chloe no favours but having said that I still love both of the characters! This is a perfect Christmas read and it gives you a real festive feeling. The family are building up to the big day and we get to be with them on a traditional Christmas day opening presents and sitting down to a Christmas dinner. There are many little story lines going on through this book involving each of the many characters and yet Carole manages to tie them all up and bring them together so they all come together to make a perfect read. I think this book brings out every emotion from excitement to family troubles, heartache to romance. Oh and how can I forget the humour! There was more than one occasion where I found myself laughing out loud my favourite involving Juliet and the Kitchen table! Once again I find myself taking my hat off to Carole Matthews she really is the Queen of chick lit and doesn’t ever seem to falter so thank you yet again for a fantastic read. Looking for a traditional and festive story with all the trimmings then With Love at Christmas is the book for you.